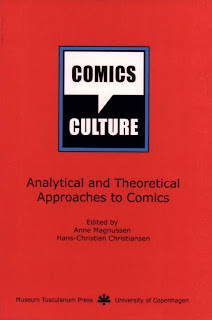 I started reading Comics & Culture: Analytical and Theoretical Approaches to Comics on my lunch hour today. It's a collection of essays on various aspects of comics that were written in the late 1990s -- early 1998, by my guess. What's been of particular interest so far has been Roger Sabin's article on the Internet's impact on comics. Sabin, of course, was writing and researching this subject a decade ago, and it's interesting to read his thoughts on the matter with that ten years of hindsight. He has some interesting tennets in his pieces, largely in reaction to Scott McCloud's unbridled enthusiasm for the subject. 1. Sabin takes issue with McCloud's definition of "comics." While I don't know that I fully agree with McCloud, I think he's more on the mark than Sabin who seems to overly restrict comics to items that are specifically aimed at a mass media audience. Further, McCloud expressly stated in Understanding Comics was that he was proposing the defintion in lieu of anyone else having done so, and that it was a subject that can (and should!) be further debated. 2. Sabin claims there is a false assumption that "because comics work on the printed page, they will automatically work on the net." Sabin notes that comics cannot be simply scanned and placed online and "work" in any real sense, and offers up some then-contemporary work as evidence. It seems to me natural that changing mediums like that (printed comics to computer screen) one will inevitably run into incompatibilities like those Sabin describes. But he somehow seems to ignore the possibility that comics could be created specifically for online consumption. His idea seems to be that the limitations inherent in printed comics are also limitations in online comics, which have further limitations imposed on them by the new medium. He reiterates some of his intial arguements here, as well, suggesting that online comics cannot be comics because, at the time, they weren't readily accessible by a mass market. That comics needed to be easily portable and an additional level of literacy (that of the computer) was needed in order to view them. While he was indeed correct about some of the technological limitations at that time (and I can't fault him for being skeptical of then-hypothetical future advances), it still seems to me that limiting comics, by definition, to a mass-produced, mass-media environment is too inherently limiting. 3. He finally counters "False Assumption Number 3: That net comics are the next historical step for the comics medium." His rationale is largely based on the premise that the rise of one medium will not eliminate another. While that is true, certainly, he seems to be assuming a couple of absolutes that don't make sense to me. In the first place, he's countering the arguement that net comics are the next step... which will occur in the next ten years. He doesn't expressly put a timeline to his thesis, but there seems to be an assumption of one, as he precludes the notion that the "next step" might occur beyond his lifetime. In the second place, I don't know of anyone who's claimed that print comics will be completely obliterated by the rise of online comics. Now that might be just the circles I travel in, but I don't believe even the biggest proponents of online comics ever claimed that print comics would entirely vanish. I don't know if Sabin holds the same ideas today in 2007 that he held in 1998. Obviously, the landscape for both the comics and computer industries has changed immensely in that time, and I think it's unreasonable to have expected Sabin to accurately predict all of those changes. But I think it's fascinating to look back on a set of opinions like these to contrast those of, say, McCloud and contrast them both against the reality of what's actually happened. Neither "side" of the debate was ultimately any more right than the other, and their predictions noticeably missed their respective marks. Which all goes to show just how unpredictable the future really is, and that anyone (myself included) throwing out any predictions beyond the next several months is mostly blowing smoke.